The Craigdarroch Arms Hotel has been in existence for well over 100 years. Situated in the centre of Moniaive, it is the heart of the community and offers a warm welcome to locals and visitors alike. There is a traditional bar with sky sports and a log burner where locals enjoy a ‘blether’. A lounge bar for a more relaxing atmosphere and function room with pool table. Rooms available – the bedrooms have en-suite facilities, central heating, tea and coffee making equipment and colour TV. Price includes a full cooked breakfast and VAT. The bar menu offers a fine selection of meals with daily specials. and themed nights. The hotel welcomes golf and fishing parties. The George Hotel is one of the oldest inns in Scotland. Newly refurbished rooms all ensuite. Games room and traditional bar. The hotel welcomes golf and fishing parties. This modern single-storey barn conversion has been completed to a very high specification and holds the cottages4you Gold Award after receiving 100% “accommodation Overall” feedback from customers. It sits on the edge of the village with uninterrupted views of the countryside yet is just two minutes walk from the grocers, four excellent restaurants and the two hotels. The accommodation is on one floor and comprises a large lounge, double bedroom, wet room with shower, a large kitchen/diner and a wooden deck. 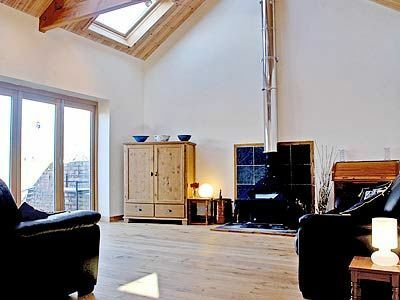 The lounge has an Oak floor, leather settees, atmospheric wooden beams and Velux windows. An 8-foot glass and wooden door folds away to give access to a wooden deck equipped with table and chairs, sunshade and a barbeque. Heating is oil fired under floor central heating and a Dowling wood burning stove. Facilities include a wide screen television with Sky+, DVD player and a CD player. There is also a small library of films on DVD. The kitchen is fully fitted with an electric oven and hob, microwave oven and washing machine. The double bedroom is Oak floored with fitted wardrobes and a bookcase stocked with local books and paperback novels. There is a foldaway bed available on request for children as well as a cot and highchair. All fuel and power, bed linen and towels are included in the price. One pet welcome. Auchencheyne Country House, Glencairn valley in Dumfries. We offer quality holiday cottage accommodation and ‘bed and breakfast’ style holidays in the country. Self-catering holiday house sleeps 6. Bed and Breakfast also available. This detached, single-storey renovated cottage is located within the village and 2 minutes walk from the grocers, pubs and hotels. Accommodation is on one floor and comprises Lounge/kitchen, shower room with toilet and basin, 1 double bedroom. There is a patio with outdoor furniture and off road parking for 1 car. Glenluiart Lodges are situated in the grounds of Glenluiart, an A-listed Arts & Crafts Country House one mile from the Conservation village of Moniaive. Glenluiart Lodges comprises four Self-Catering Lodges that sleep from two to seven persons. Details of the Lodges can be found at www.glenluiart.co.uk. Glenluiart is found easily by entering the postcode DG3 4JA in google maps online, or on any smartphone, or on a satellite navigation system. It sits on the B729 in the midst of rolling countryside in the parish of Glencairn, Dumfries & Galloway. Moniaive is a relatively busy village with around 500 inhabitants. The village has a large general store and post office, two hotels with restaurants and an Italian pizzeria so finding something that suits will not be an issue. In addition, there is a petrol and service station. For entertainment, the village has a live folk culture so there is always something going on. The Lodges have been designed around the needs of older travellers without children or pets as peace and quiet is the key to get the maximum benefit from the surrounding countryside and away from the life of the village for a perfect sleep and rest. We welcome everyone and request that if a visitor has special needs that they inform us of their requirements prior to booking so we can establish if we have accommodation that is suitable for their needs. The cottages are available for let in full weeks only running from Friday 3pm to Friday 10am the following week. The tariff and specification for each cottage is detailed on their individual pages and does not change throughout the year. As these are holiday cottages, a deposit of 30% is required on booking, with the full balance being paid nine weeks in advance of the holiday. Terms and Conditions are detailed on our Terms and Conditions page which you should read before confirming our booking. In the meantime, if you have any queries please do not hesitate in contacting us below or make an electronic online booking enquiry on the glenluiart.co.uk website. 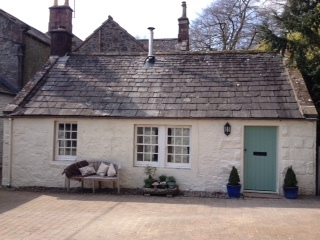 Terraced holiday cottage (non-smoking) quietly situated in the very scenic and lively village of Moniaive. Newly renovated. Accommodation all on one level. Sitting room with open/closed wood burning stove. Double bedroom. Twin bedroom. Bathroom with bath and shower over. Small sitting area to the front. On street parking for one car. Bike store. Shop, pubs and restaurant 200 yards. TV, Freeview, DVD Player, CD Player, washing machine/dryer, microwave, and electric storage heaters. Initial supply of wood as well as all power, bed linen and towels, are included. One pet welcome. Available for weekend breaks (minimum 2-night stay) as well as weekly lets. Dumfries & Galloway is a beautiful area full of many places of interest and excellent for cycling and walking. For further information please contact Jane on jcsimpson21@gmail.com or on 07903 388 361. Glebe Lets are exceptional Scottish luxury cottages with hot tub set within the beautiful surroundings of Dumfries & Galloway. Visit www.glebelets.com for further details. Located Moniaive’s neighbouring village of Tynron. Getting to Moniave could not be easier from the Millhouse, its only two miles over the “Brae”. Millhouse cottage has 1 double bedroom and 1 bedroom with 2 single beds. It is ideal for families and with the extra fold down bed available can sleep up to 5 people. It has a large reception room with TV, DVD, games and an open fireplace. The dining room has seating for up to 8 people and also has an open fireplace. The bathroom has both shower and bath. The kitchen is equipped with a Bosch washer/dryer oven, hob, microwave and coffee machine. It has a good size garden to relax in. There is complete privacy, 2 outdoor dining tables and lounging garden furniture where you can listen to the river and the wildlife. Wireless internet is also available. An outstanding spacious and modern cottage occupying a magnificent clearing in its own woodland. The cottage provides spacious accommodation for 6 people which is naturally light and has been carefully furnished and equipped to high standard. Peacefully situated within Dunscore Glen, this detached holiday property, offers panoramic views over pond and woodlands. Nestling in the heart of the Dumfriesshire countryside, there is extensive walking throughout the 240-acre grounds and the opportunity to watch deer, birds of prey and owls in their natural surroundings.